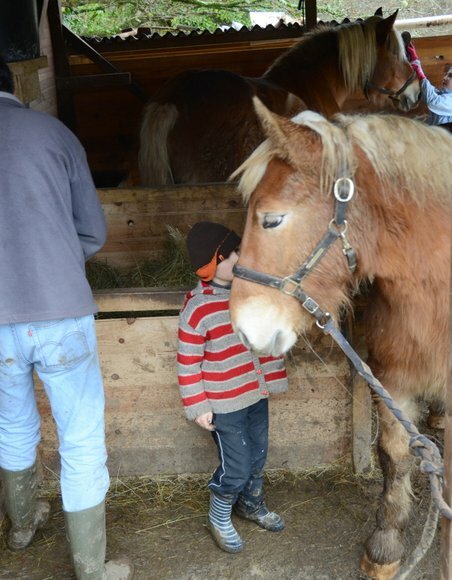 The big problem with draft horses roaming free in the pastures is that they get very dirty in winter. and of course they hate being closed up. Living on hills don’t make it any easier. So we keep them in a smaller camp, both for their own sake and for the fields’ sake. But with the many rains and the muddy slopes and everything just awfully dirty and wet, it stays a challenge to give them some excercise and keep them clean! and groomed. 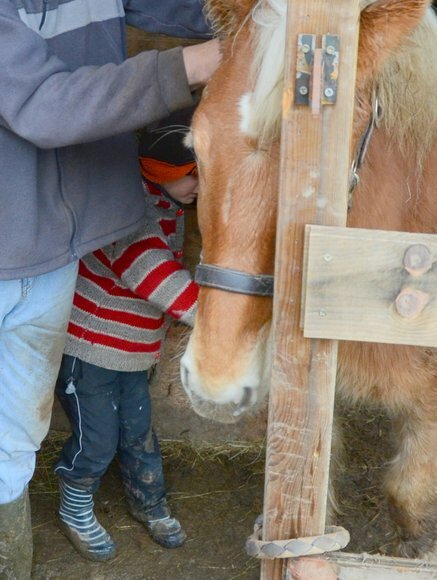 Today we washed them a little bit and mon chéri had eager little hands to help. Afterwards, with a cup of warm “chocolat chaud” and contentment with their good work written all over their dirty faces, they looked muddier than the horses, which meant THEY then needed a wash! This entry was posted on February 15, 2014 by Myfrenchkitchen. It was filed under Coin Perdu, country living, France, French countryside, French living, horses, nature and was tagged with animals, Coin Perdu, draft horses, France, French countryside, horses, nature, Ronell van Wyk. What a wonderful post, Ronelle. I am always so glad to hear about Coin Perdu. My daughter’s horses turn right around, after a bath, and roll in the mud, again. I hope yours are more appreciative. Especially since they had the extra loving and attentive Little Hands to get them so clean. Another one in the series of work based on my daughter and her belongings.